Even key chains can serve multiple purposes, like the Vargo Titanium Key Chain Tool - 1.2, which was designed with backpackers in mind. 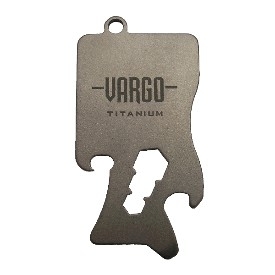 Similar to the Vargo 1.1 Titanium Key Chain Tool, the 1.2 features a reverse-cutting can opener, bottle opener, 5mm/6mm/8mm wrenches, flathead screwdriver, and key ring attachment. With full titanium construction, you’ll forget you’re even carrying it.